Christopher Reeve not only dons the title hero's cape for the fourth time but also helped develop the movie's provocative theme: nuclear disarmament. "For me, it's the most personal of the entire series," Reeve said. "It directly reflects what Superman should be, and should be doing." Superman does a lot this time around. To make the world safe for nuclear arms merchants, Lex Luthor (Gene Hackman) creates a new being to challenge the Man of Steel: the radiation-charged Nuclear Man (Mark Pillow). The two foes clash in an explosive extravaganza that sees Superman save the Statue of Liberty, plug a volcanic eruption of Mount Etna and rebuild the demolished Great Wall of China. Your quest for excitement is over! 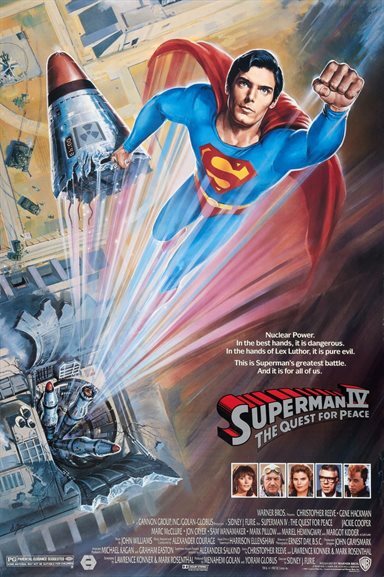 Download Superman IV: The Quest for Peace in Digital HD from the iTunes store. Superman IV: The Quest for Peace images are © Warner Bros.. All Rights Reserved.